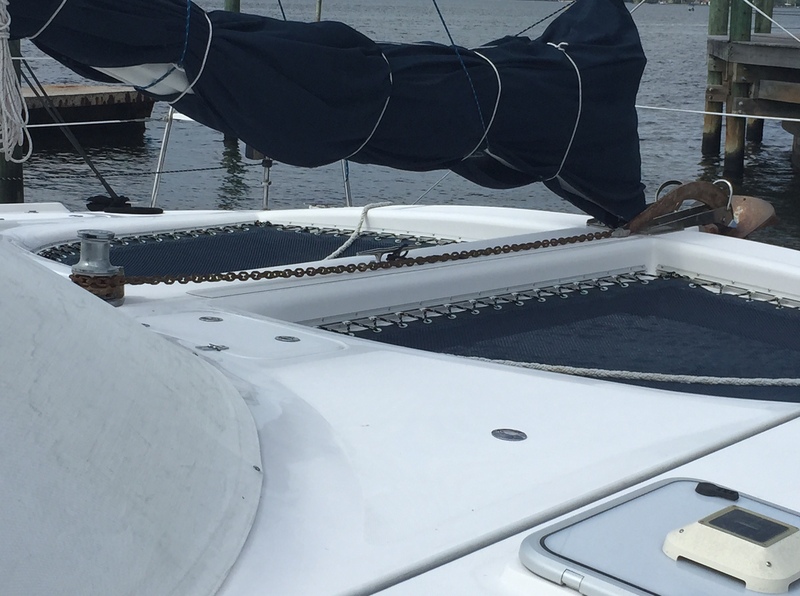 Our St Francis 50 catamaran is in Bradenton, Florida for a refit. The vessel name, logo, trampoline, and canvas cockpit cover are changing. Now is the perfect time to add a little colour and personalization. Right now, in terms of a colour scheme, my husband and I are thinking blue with a splash of tangerine – similar in tone to the St Francis Marine logo shown below. 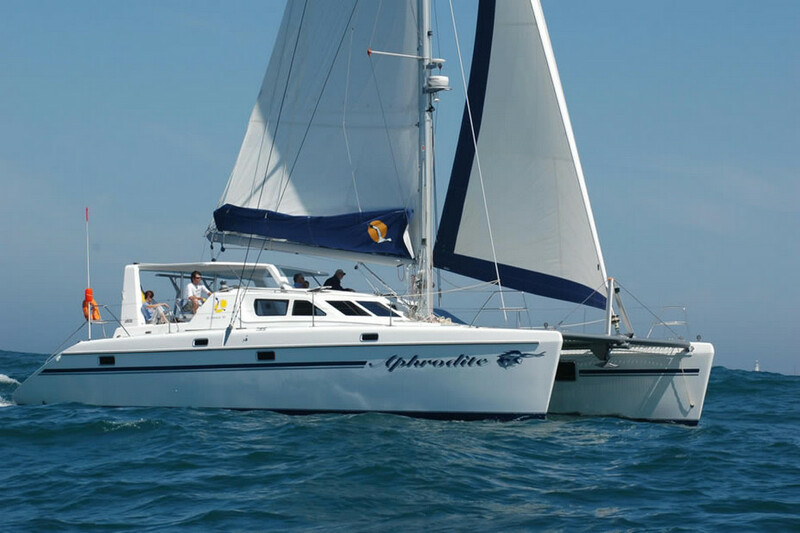 We have legally renamed the boat back to its original name, the SV Aphrodite. So, we will be replacing the current Black Swan logo and the blue stripes on the side of the boat. We’d like the SV Aphrodite side-of-boat artwork to have some colour, to reflect that we are Canadian, and to incorporate our four children into the design. All this, while preserving a tie-in to the original artwork of the SV Aphrodite. Original SV Aphrodite artwork for starboard (top) and port (bottom) sides of the boat. Credit: St Francis Marine (2005). As you can see from the graphic above, the original SV Aphrodite artwork displayed a sensual but strong woman with one arm outstretched, and wild hair blowing out behind her. It is as if Aphrodite is leading the way. This sense of forward motion is something we wish to preserve in the new artwork that will appear on our boat. Our friend, and graphic designer, Fe Wyma of Kapwa Communications is helping us with the artwork and colour scheme. Fe’s artistic leanings towards Northern Art, and the fact that she has known us for years, makes her a perfect fit for personalizing the original Aphrodite artwork for our family. And, I wish I could show you some of Fe’s design concepts. She has come up with some great ideas to introduce some colour and personalization. Each of Fe’s design concepts marries our family’s Canadian roots with the original Aphrodite artwork, while also pulling in some personal aspects. She depicts our four children with a special nod to our set of twins, for example. I can’t show you yet – but her ideas are quite subtle and original. On a similar but less artistic note – today, we picked the colour of the trampoline. Currently, the trampoline is a safety concern that needs immediate attention. I didn’t mention this before, but prior to the passage from Fort Lauderdale to Bradenton, my husband fell up to his neck through a hole in our trampoline. It was a bit embarrassing for him. Other folks chalked his mishap up to inexperience – saying he should always look where he was going – until someone else with experience fell through the trampoline. Originally, we wanted our trampoline to be white with grey trim. Apparently, white can look dirty quickly. So, we chose Dark Blue for the trampoline. Our trampoline will look something like this once it is installed on our boat. Here is a sampling of trampoline colours that we were looking at, arriving at Dark Blue, not Pacific Blue, which we deemed to be too bright for our colour scheme. The existing trampoline appears at the top of the photo below. To reduce weight, we opted for a different weave. The new trampoline will shed more water than the existing one, which is important if we meet with rough weather. 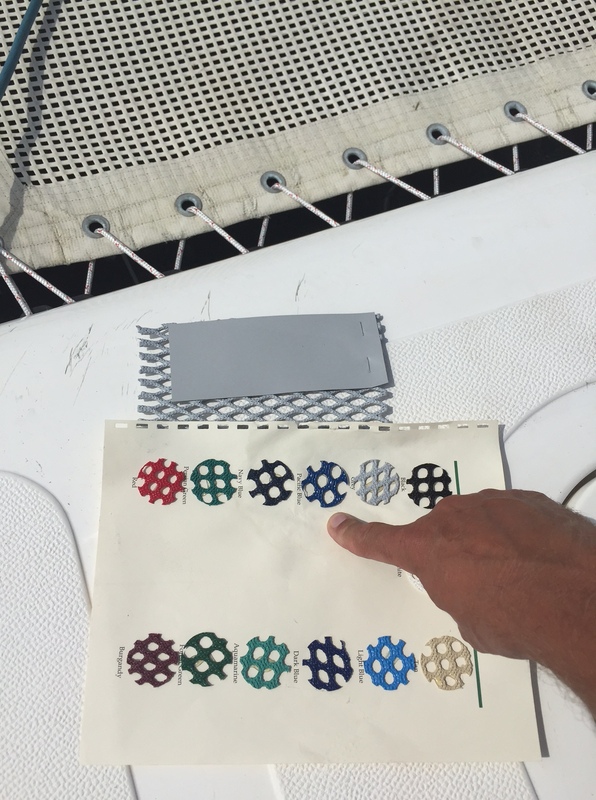 For the cockpit cover, we chose Sunbrella’s Mediterranean Blue Tweed, which is a deep but dignified blue. Admittedly, it was not a brave move on our part. This colour is seen on many other cockpit covers. I can’t wait to show off Fe’s fantastic artwork for the SV Aphrodite. Right now, we are deciding, which one works best with our boat, and Fe is tying her design ideas even more tightly to the original Aphrodite artwork. Wild hair might feature in the design concept, for example. Fe’s work ranges from Art Deco to imagery that borrows from Inuit culture. Stay tuned for the big reveal. NOTE: If you are curious about how we legally changed the vessel name, see my post about transferring boat ownership.